"The famous Perseids meteor shower will be observed with its peak on the late night of August 12 until dawn on the following day...occasionally, an exceptional shower may show tens or even hundreds of meteors per minute, but around 50 meteors per hour is more typical." 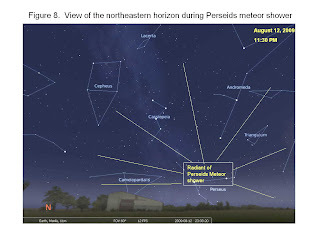 The Perseids meteor shower is the most reliable one, which is best seen during August 10-14 every year. Under most favorable clear sky condition, there may be 60 to 100 meteors per hour." If you see a shooting star, what will you wish for? Wow, how romantic! Hindi ko ito nakita! :P Ikaw? That's a nice wish madz. ...and a 2 seater couch, a floor lamp, a full length mirror and a new bicycle. :D hehehe!